In stock -This product will ship today if ordered within the next 4 hours and 21 minutes. 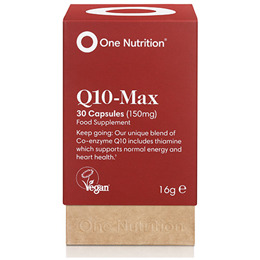 Co Enzyme Q10 is the common name for Ubiquinone; a key component in the electron transfer system used by every cell in the body. It plays an essential role in our energy and is found in high concentrations within the heart. 100% RDA Vitamin B1. Vitamin B1 (thiamine) is used throughout the body to help keep the nervous system working. As the heart is the most active muscle in the body, requiring constant fuel and co-ordinated messages from the nervous system, it is the ideal aid for heart health. Vitamin B1 is also beneficial for supporting energy levels so you can maintain a healthy lifestyle. Cellulose fibre (filler), Ubiquinone (Co Q10), Vitamin B1 (Thiamine), Capsule shell: Hydroxypropyl methyl cellulose. 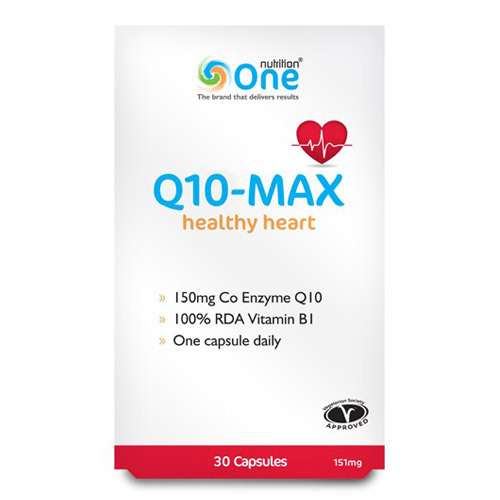 Below are reviews of One Nutrition Q10-Max - Healthy Heart - 30 Capsules by bodykind customers. If you have tried this product we'd love to hear what you think so please leave a review.